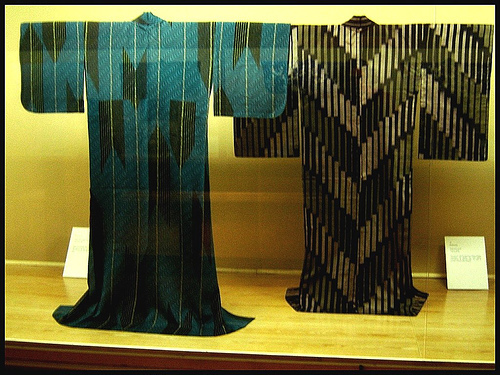 In Edo period (1603-1868), there were no ready-made kimono; therefore, when they want new kimono, they went to kimono shop and bought kimono materials, and then placed orders with tailors, or made kimono themselves. This is only rich people’s case. The ordinary people usually bought kimono at secondhand clothes shops. At that time, wearing old-clothes was not miserable but a common thing. There were many secondhand clothing shops in Edo (old Tokyo). The amazing thing is that they recycled a kimono over and over until it got reduced to ashes. They even used the ashes. This is a kimono’s life. When kimono got old, they tailored a child’s kimono out of some good parts of the kimono. When it got tattered, they made diaper out of it. When it got all ragged, they used it as floorcloth. After finishing the life as a cloth, it was used for lighting a fire and the ashes were used as laundry soap or manure. 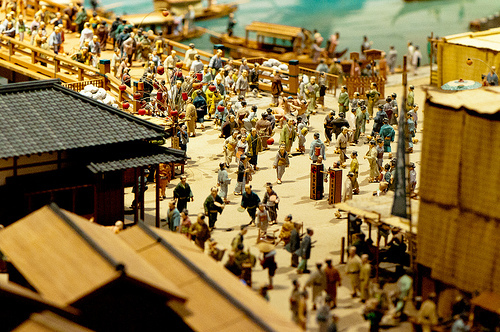 Recycling was a major business in Edo period. They always needed various types of business such as fabric-scrap shops and ash purchasers for the recycling society. That is why the economy didn’t stagnate even brand-new products didn’t sell well.